This entry was posted on April 28, 2017 at 1:02 pm and is filed under Jazz with tags Balanced grip, Dave Brubeck Quartet, drums, Joe Morello, trad grip. You can follow any responses to this entry through the RSS 2.0 feed. You can leave a response, or trackback from your own site. There is, presumably, a prior left/right asymmetry which causes drummers like Morello to prefer different grip by their left and right hands. (Otherwise you’d expect some drummers to prefer Morello’s left-hand grip on both sticks.) Is this prior asymmetry to do which is your leading hand, in which case do left-handed trad drummers play with grips and kits the mirror image of Morello’s? Or is it that drum kits are themselves designed to be assembled asymmetric, with their left-right asymmetry inducing Morello’s asymmetric grip? If so, why exactly does the kit asymmetry induce the asymmetric grip, and can you buy a left-handed kit? Yang and Lee got a Nobel Prize for their answer this question so I have great expectations of your reply! You can quite easily set up a drum kit to be left-handed, i.e. a mirror-image of the one in the clip. You don’t need different drums or cymbals, it’s just a question of putting them together differently. Funnily, though, don’t think I’ve ever seen any drummer play such a kit, even one who was left-handed. That goes for the feet too: it’s always the right foot on the kick drum (bass) and the left foot on the hi-hat. The one thing I have seen left-handed drummers do is play open-handed, which means hitting the snare with the right stick and the hi-hat with the left. The usual thing for a right-handed drummer is to cross hands when playing both the snare and the hi-hat, so that the right stick plays the hi-hat and the left plays the snare. This involves crossing the hands. This approach is presumably used because the right hand is stronger and the right arm can more easily manage the extra reach for the hi-hat as well as the tom-tom and the crash symbols, to the right of the kit, while the left usually stays closer to the body. I’m not sure why you don’t see many fully left-handed kits, except that it must be like the piano. Left-handed pianists use the same keyboard as the right. Many rock drummers do have a kit which is more symmetric, however, e.g. having two kick drums. There are some famous rock drummers who a) are left-handed and b) play left-handed kits: Phil Collins, Ian Paice, the late Mark Craney. The hi-hat is usually hit with the right hand by a right-handed drummer with a right-handed kit, though some good drummers can play 16th-notes with the left hand on the high hat (I’ve seen Neil Peart and Pierre Moerlen do so). Some have an additional hi-hat on the right. Ric Lee has a total of three hi-hats. I have even seen a left-handed flute player playing a left-handed flute! (A former girlfriend was left-handed (5/8 of my girlfriends are left-handed; not sure what to make of that! ), but played a right-handed flute. Presumably there isn’t that much difference in the hands with regard to the flute, while there is for other instruments, in particular string instruments. World-famous Baroque violinist Reinhard Goebel is right-handed, but due to a nerve disease affected his left hand switched and now plays left-handed (he can still hold the bow with his left hand). Guitarists have the most variety: one can play right-handed or left handed, the strings can have the lowest in pitch highest on the instrument or vice versa, the body can be left- or right-handed, the neck can be left- or right-handed. I’ve probably seen all 16 combinations. Logically, everything would be reversed, but since right-handed instruments are more common, many learn to play them, either right-handed or left-handed, in the latter case reversing the strings or not. Some can later afford a left-handed instrument, but some get used to the right-handed variety. An example of the latter is Jimi Hendrix. The fact that various controls on the electric guitar were above rather than below the strings influenced his playing style, so some right-handed guitarists following in his footsteps take a left-handed guitar and reverse it. Joe Morello didn’t need two bass drums to play fast! Interesting, he also used quite a large (22″) bass drum by Jazz standards (18″ is normal for small-group drummers). He certainly gets a big booming sound in the clip, and he there lots of heavy bass drops in his famous solo on Take Five. Perhaps to some extent, but the main reason is that this dates back to the days when one played a (military) drum while marching; check out historical pictures to see why. Just yesterday, while surfing YouTube I came across a video of Buddy Rich (certainly in any serious top-ten (or even top-five) list) explaining while he uses traditional grip. Yes, that’s right. I think the marching bands set the symmetry and as drum kits grew from a simple snare, cymbal and drum combination the other components were added to the right of the kit (e.g. extra cymbals, tom-toms) so they could be more easily reached with the stronger arm. Thanks Peter; has anybody played with both hands holding the sticks beneath, as with Morello’s left hand; and if not , why not, please? Yes, I’ve seen Billy Cobham play like that. It’s rare, though. I think it’s to do with the ability of moving around the kit with the right hand. 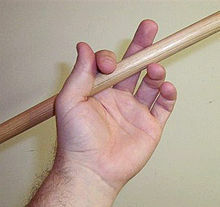 With a classic grip the stick is pointing inwards, roughly at right angles to the arm. That’s fine with the left because you’re usually playing on the snare, but with the right hand it’s awkward to reach, e.g., the tom-tom that way because you have to move the arm further and open out the wrist if you use a trad grip on the right. With the overhand grip the stick is parallel to the arm which makes for easier access. There have been some rock drummers who are perhaps not so technically proficient but have a superb feel for the music they play. Keith Moon comes to mind, and I reckon he could manufacture an appropriate fill for any gap. Interesting you should mention Keith Moon. His favorite drummer and inspiration was none other than Gene Krupa. It is said that “Animal” (the drummer in the Muppet Show) was based on a combination of these two! I think one of the very best rock drummers was Mitch Mitchell (of Jimi Hendrix fame), who I think is exceptionally underrated. I just checked on Youtube and discovered, to my surprise, that he also used a classic grip. Many rock drummers of his age used traditional grip. I would say that Moon was both, at least for his type of music. There is a song on Who Are You with only cymbals. A departure from the usual fare, Moon couldn’t make it work for him. Somewhat frustrated, he declared “But I’m the best Keith Moon style drummer in the world”. I recently saw (what is left of) The Who. Although John Entwistle was an excellent bassist, Welshman Pino Palladino did a good job filling his shoes. On drums was Zak Starkey, a good drummer in his on right, but at this show channelling Moon, which is itself quite impressive. I was in the first row of the balcony, at the side of the stage, with an excellent view of Zak. Which drummer is both the most famous and the most underrated? Ringo Starr. I love watching him play with classic grip. He’s the next member to get a solo, and I can’t help but notice he has tucked his T-shirt into his jeans. Interesting. I didn’t expect that from the drummer.